Still want to squeeze out every last drop of fantasy football juice this season? Of course you do. There’s no better way than a 2018 NFL Playoffs Fantasy Football League. And the biggest key to dominating? Getting the most games played out of your players with the best Team Rankings. Just like regular fantasy football, you draft actual NFL players and score points based on their performance. 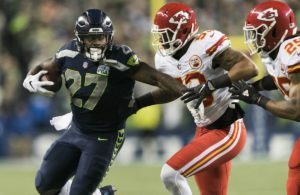 Unlike regular fantasy football, you are NOT matched up with a weekly opponent, and instead your goal is to to score the “most total points” over the entire course of the postseason. This makes the quality of the team equally, if not more, important than that of the actual player when you’re drafting: the more games played, the more chances to rack up points. Thus, the top picks are the highest point-producers with the most games played. 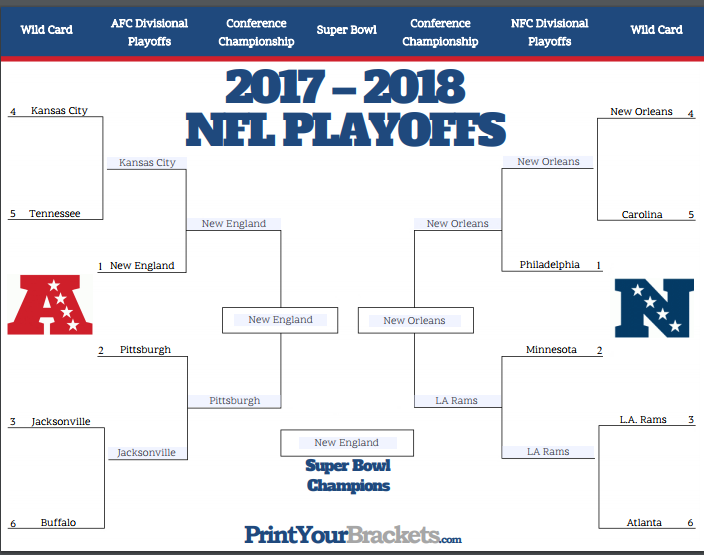 Here is how I see the playoffs unfolding, followed by my Team Rankings for the 2018 NFL Playoffs. Though I feel the AFC is a near-lock (Patriots), the NFC might be the most wide open in NFL history, making the second tier of teams incredibly difficult to sort through. 1. 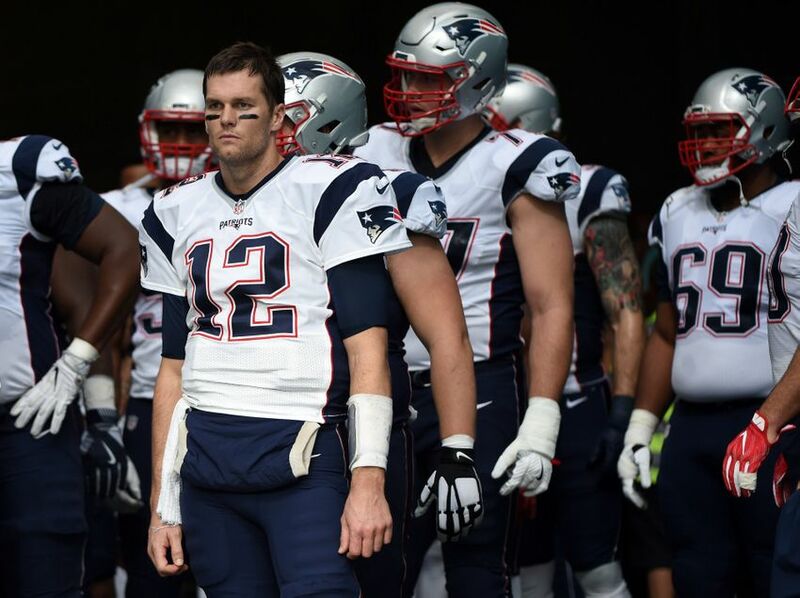 New England Patriots / 3 Games Played / 90% Super Bowl confidence. With homefield locked up for the second year in a row, no one is coming into Gillette and winning. This means three games, locked in, for some highly skilled fantasy talents. Tom Brady will be my locked in No.1 QB, while Rob Gronkowski deserves top-10 overall consideration with the massive talent edge + games played combo he’ll represent. Meanwhile, Dion Lewis and Rex Burkhead make for fat better backfield options than, say, Devonta Freeman, as their three game output should be higher than a single game of Freeman, even if he is the superior talent. My only fear here is NOT the Steelers — Brady simply has them by the balls. Rather, Kansas City has come into Gillette and thrashed us already. 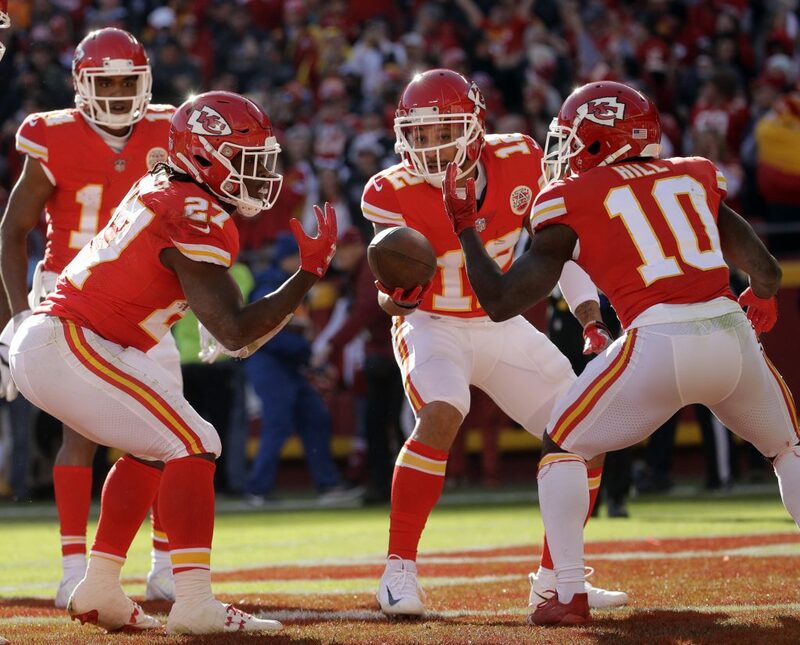 The chances of a repeat seem slim-to-none, but the Chiefs are built in a way that could really challenge the Patriots. I still think they’re a lock for another Super Bowl run. Whereas New England caps nearly all other AFC Competitors at 2 Games Played, a wide-open NFC creates insane four-game fantasy upside. In fact, while Patriots players will help buoy your team’s fantasy floor, properly picking talent from the NFC Representative will likely swing NFL Playoffs Fantasy Titles this year. A) Drew Brees‘ and Sean Payton‘s “been-there” veteran presence amidst an overwhelmingly green crop of competing quarterbacks and coaches. More than just their individual identity, I love their potential path for a serious run. The Panthers are definitely a threatening first round matchup, but the Saints have put up over 31 points in both encounters this season, and have the benefit of playing at home. Beating a team three times in a single year is difficult, no doubt, but I think they pull it off here. With a win, the Saints would be set up to play the Eagles in Round Two, assuming the Rams handle business (which I project). Despite their No.1 status, I think the Eagles look prime for an early exit after abysmal back-to-back performances from Nick Foles. A showdown with the aforementioned and explosive Rams or fiesty Vikings are my largest concern at the Saints’ Super Bowl bid. Yet, at this point, you would’ve gotten at least three games out of some highly explosive talents in Brees, Alvin Kamara, Mark Ingram, and Michael Thomas. I’ll be targeting them heavily after the floor of the Patriots. I almost ranked the Rams ahead of New Orleans because they have less “one-and-done” risk against the Falcons (as compared to the Panthers for the Saints). However, the Round 2 road matchup versus the Vikings does make me quite a bit nervous then if they had the Eagles lined up next. Still, there’s a ton to love about the Rams. Most importantly, they control the tempo and clock with MVP Candidate Todd Gurley. He’s both a bruiser and a threat to house it on every play, and this dual-threat will absolutely wear out any defense. If you get 3+ games out of this animal, who finished the fantasy season with back-to-back 45+ FP performances when owners needed it most, you’ll be in fantastic shape. Plus, offensive genius Sean McVay — the youngest coach in NFL History to earn a playoff berth — knows exactly how to deploy his weapons. 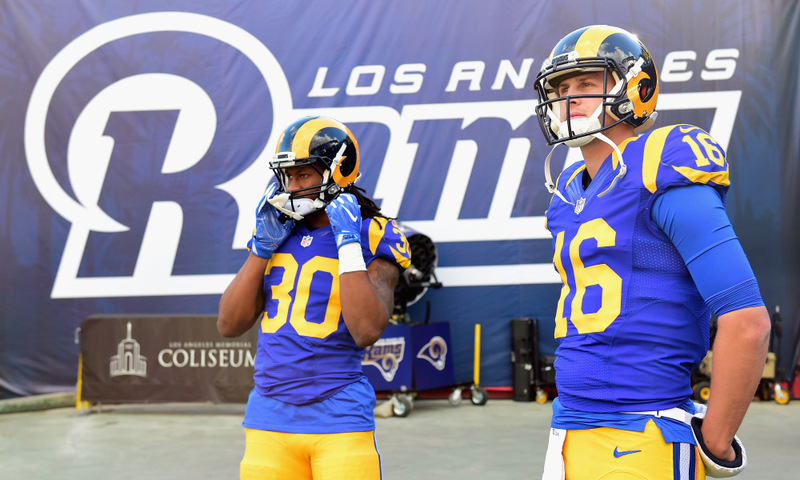 From dialing up creative screens, to bombing teams deep, to then grinding them down when they’ve been stretched all over, McVay crafts ideal game plans and will know exactly how to exploit each team he faces. The way he’s revolutionizing audibles at the line just shows his “step ahead” tendency. Stir in a rapidly ascending Jared Goff, a versatile and stacked receiving corps, and an attacking defense, and I like the Rams shot at 3 games, minimum. If this happens, they’ll pour on the fantasy points and crown you. Here’s the trickiest team for me to project. The potential “Home Field Super Bowl” motivation is enormous, and cannot be discounted. Given that this is also tied to a fiery defense, a motivated Case Keenum, and a creative yet grind-it-out offense with oodles of receiving and rushing talent… and we’ve got a dangerous combination. In all honesty, they seem like the safest bet to make the Super Bowl of the NFC. Still, my gut screams Rams or Saints, and the Vikings would have to plow through both to make the dance. Plus, they have the “Super Bowl Host” curse: since 1967, only 7 teams who are hosting the Super Bowl have made the playoffs. Of those 7, only 4 make it past the Wildcard round. Though the Vikes automatically cross both off with a Wildcard Bye, no hosting team has made it past the Divisional Round. With history and explosive competition working against them, I’m not immediately targeting the Vikings as my NFC Anchor Team. Still, I’m also not upset landing multiple guys if both the Saints and Rams have been plundered. In addition to Keenum’s strong viability as a QB1 (after Brady, Brees, and Goff IMO), the explosive WR combo of Adam Thielen and Stefon Diggs make excellent targets. Additionally, Kyle Rudolph, with his three-game upside, is the clear-cut No.4 tight end after the elite talents of Rob Gronkowski, Travis Kelce, and Zach Ertz. Tier 2 Summary: The Saints are my favorite to represent the NFC, which creates enormous four-game upside. However, the Rams also make an incredibly strong four-game case, and seem to be the safest of the NFC bunch for at least two contests. I’ll be targeting both teams heavily, and, contrary to usual strategy that recommends an AFC and NFC “Anchor Squads,” I actually could roll with two NFC squads since both would combine for 7 Games Played if my projections pan out. 1) Their projected matchups (Titans, Chiefs) are a lot softer fantasy-wise than the buzzsaw Jaguars defense. 2) The Chiefs could actually come into Gillette, win, and thus carry low but slightly real 3-4 upside — they did just that to open 2017. The Steelers, however, won’t come here and pull this off given Brady has Ben Roethlisberger by the balls: 8-2 overall versus the Steelers, including a pristine 4-0 at home. Thus, I actually think your Kansas City players carry more upside than your Steelers. Granted, I think both teams will be capped at two games, so I’ll likely side with the elite talent of Le’Veon Bell and Antonio Brown over the slightly-less elite Kareem Hunt and Tyreek Hill. But don’t be surprised if those two + Alex Smith rack up some serious points before exiting… if they even do at all. Despite an abysmal 1-6 stretch, the Chiefs found their footing to end 2017 by riding Hunt as their horse. He projects as a potential points monster for his 2 games. Meanwhile, when Hunt is churning, Hill is usually freed up on the outside. Not a single corner can run with him downfield one-on-one, so don’t be surprised to see a Hill explosion versus the Titans. Plus, if the Bills pull off a shocker versus a reeling Jaguars squad, the Chiefs definitely have a shot at upsetting the Steelers on the road and creating a 3 Games Played scenario. If I’ve gone Rams or Saints early, I imagine I’ll find a lot of Chiefs on my squad. Most of my Steelers analysis is done above, but the individual talent levels are just too high to rank any lower. Even if the Jaguars present a daunting matchup, the Steelers studs (Le’Veon Bell and Antonio Brown) always get their stats. The Patriots have also been serving up fantasy points on a silver platter, so a Conference Championship game should prove fruitful even in a losing effort. Is there any shot Pittsburgh could come into Gillette and pull off an upset? Highly doubtful. Big Ben has never won in Gillette, and Brady owns this matchup at 8-2 overall. Still, they have the offensive firepower, explosive special teams, and a turnover-causing defense. If the upset ever happened, Bell, Brown, and Ben would all be NFL Playoffs Fantasy heroes, making them well-worth Round 2 or 3 plunges as your AFC Anchor Squad (assuming the Pats are gone). JuJu Smith Schuster is also a high upside Round 4 or 5 WR2 target. Here’s the greatest Wildcard of all the teams. Though unlikely, Carolina could go on an epic four-game run. In this case, Cam Newton would be a league-winner, as this type of run would require epic play (and balls) from this physical freak. The upside alone makes Newton a worthy late Round 2, Early Round 3 target for those who locked up the floor of Brady. Unfortunately, we’ve seen how Newton plays with the deck stacked against him: softer than baby poo. The Saints have owned this team all year, and I suspect they’ll eliminate the Panthers again, barring an absurd defensive effort. 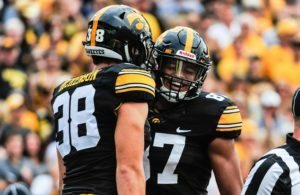 Still, a second round matchup versus the Eagles would be very winnable (if not likely), so Christian McCaffrey, Devin Funchess, and Greg Olsen all need to be drafted. I just wouldn’t extend an arm given their status depends on the highly fickle Newton. Two weeks ago, I would’ve been far higher on the Jaguars chances of upsetting Pittsburgh. Instead, the Jaguars are spiraling downwards after back-to-back losses against some weaker competition. Of course, I still think they can mop up the Bills, especially if their offensive centerpiece in LeSean McCoy cannot roll. In fact, the Jaguars are built for postseason football: run-obsessed coach with a monster to ride, alongside a defense with corners that can shut down WRs and rushers that get to the passer with minimal blitzing. Still, their fortunes ride on the arm of Blake Bortles. Despite his stretch run heroics, the ugly side of Bortles has reared its menacing head as of late, and I expect only two games out of this squad. If the team catches fire against the Bills, a Pittsburgh upset cannot be ruled out. Thus, Leonard Fournette should be treated as a top-five back, while Keelan Cole, Dede Westbrook, and even Marquise Lee bring some upside to flex spots. The Eagles have homefield advantage on their side… and that’s about it. 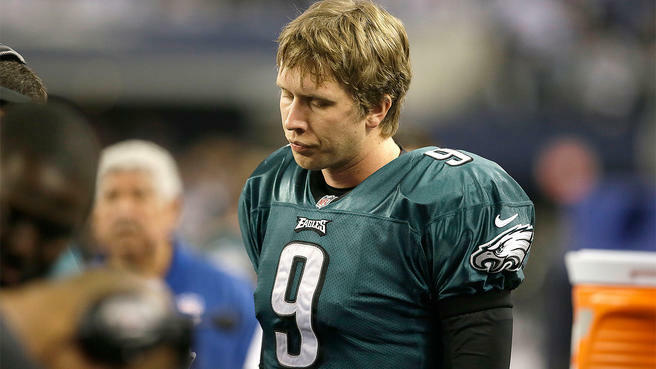 Nick “folds” Foles has been dreadful, manufacturing 19 and then 0 points against two suspect defenses in his last two. While the team around Foles could be enough to propel the Eagles into the Conference Championship, I highly doubt this. They’ve faced weak competition in all three of Foles’ starts, and narrowly escaped with 2 wins and one horrific loss. This makes appetizing talents like Zach Ertz, Jay Ajayi, and Alshon Jeffrey a lot tougher to trust. Indeed, there is a chance the Eagles shock us and make an epic run. The “early No.1 exit” feels just a little too buzzy. I can’t see this team making it past two quality opponents in a row, though… nevermind just one. Given how high I am on the Rams, this low Falcons ranking is unsurprising. With a beast like Julio Jones on the outside and a battle-tested Matt Ryan from last season, a run is possible. Plus, if they pull off a massive upset on the Rams, a date with the Eagles would certainly be takeable. Still, I’ve simply hated the offensive chemistry under Steve Sarkisian thus far, and don’t think that’ll be fixed overnight. Thus, the Falcons will struggle matching blows with the juggernaut Rams. They won’t have the defense to stop the bleeding, or the offense to patch it up. I might flip these two teams if LeSean McCoy’s outlook takes a better turn. Even with him, the Bills are likely to get swallowed by the suffocating Jaguars D… but there’s a minor chance of an upset with their heartbeat. The Titans are coming off a strong effort to earn their berth, but are simply too limited under the vanilla Mike Mularkey, who’s “Exotic” Smashmouth has grown a whole lot staler in Year 2. Derrick Henry has the talent to throw this team on his back if fed… but that has rarely been an option. Rishard Matthews is in a blow-up spot versus a very leaky KC Defense and makes a decent deep-league flex option for 1 massive game. Tyrod Taylor has to be the bottom-ranked QB against the elite Jacksonville secondary and potentially without his top weapon, and no Buffalo pass-catchers should be drafted. Agree or Disagree with these Team Rankings? Who’ll be playing in the 2018 Super Bowl? Sound off Below! 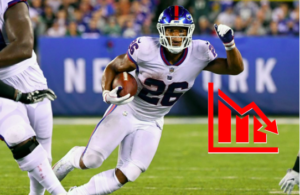 Check out how to set up your league and use our Big Board and Positional Rankings to dominate your draft!